Lately, I've seen lots of book bloggers scared or apprehensive to post things that aren't bookish. They want to... they just don't feel they can. "It's a book blog! I'm only allowed to publish bookish content!" "My readers are only interested in books!" "I want to talk about make-up and photography, so I guess I'll have to start a new blog..."
No. I mean, obviously, do that if you truly want to. But you don't have to. You are allowed to do whatever you want on your blog because it's yours. You can start a new blog if you want, but you can also write about things other than books on the blog you already have and, yes, even if your blog has the word 'book' in the title. There is no 'higher being' saying we must only post bookish content. You know why people like your blog? Why they go back to you, time and time again? If you weren't you, your book blog would be bland and boring. There would be no human connection. It's your voice, your lifestyle, your personal experiences, your personality and your interests that bring people back. It's you that makes your blog different. People like your blog because they like YOU. Write what you like. If you enjoy writing it, your readers will enjoy reading it. It doesn't matter if the post is about photography when your blog is about books. People will read it anyway. The fact that your blog is bookish doesn't have to limit you. We, as humans, are naturally nosy - you can't deny it. A behind-the-scenes insight into a blogger's life is always interesting, and people reading blogs want a human connection. They want to feel like they're chatting with a friend. So, if you're unsure whether to post something because it's not in your usual niche... just go for it. Because someone out there is going to relate and find it interesting. People aren't just interested in books. Following the crowd isn't always the best way to go. You don't have to do a certain meme just because everyone else is. If your heart isn't truly in it, don't force yourself. Your readers will be able to tell you're not writing for the love of it. In the book blogging community, there is sometimes pressure to be super professional in your reviews. Truth is, you don't have to be. It was only 2 or 3 years ago that I stopped forcing myself to sound sleek and professional. If it happens, it happens, but if you want to have fun with a review, go for it. You're allowed. In the end, you do you. Stay true to yourself and, not only will you undoubtedly have way more fun with your blog, but your own style will develop and everything else will fall into place, too. 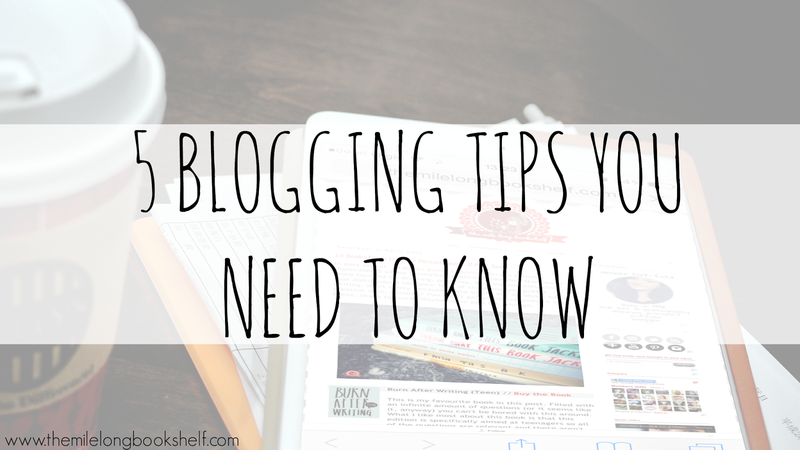 What are your top tips for blogging? Exactly! We're all so different and we each have loads of different interests. People aren't just interested in books and I'm not sure why people worry that they'll lose followers if they post outside of their usual niche because, if anything, they'll open up their blog to even more people. Thank you for commenting! Great post! I feel like this is something I'm often trying to convince people of. You don't HAVE to only blog about books. You don't HAVE to request ARCs. You don't HAVE to post reviews. You don't HAVE to blog every day. In my opinion, the best blogs are the ones that don't try to do anything. They just exist, exactly as they are. The posts aren't necessarily professional, because they're not trying to be. Instead, they're full of personality and sound like you're chatting with a friend. In fact, my least favourite kinds of reviews/posts are the "professional" sounding ones. I completely agree, and I think when bloggers talk about limits and restrictions in blogging, they're actually the ones who set them in the first place. We've probably all done that at some point, but people need to remember that taking risks and being different is good! You don't have to conform. What great advice! So often I see posts like these giving tips saying to make sure that you comment on other blogs and that you always have original, new content but having fun and loving what you write is much more sound advice. Thank you! Getting involved in the community and thinking up new ideas are always good things to do but, honestly, I think the key really is to just do what you feel like doing and don't worry about everyone else. This was very helpful! I'm new to the blogging world, and am SO IMPRESSED at how long you've been working on your blog, and how professional your writing is. Keep up the great work! The problem is there are blogger/readers like me, in fact I think within the book blogsphere you will find most are, that don't give a whip about make-up or fashion, or reality television shows, and when these start being a good chunk of the blogs content, I can't follow anymore. I am not talking about a weekly wrap up post that includes personal items like The Sunday Post, but when posts start having non-bookish things included on a regular basis I don't have the time. I don't think it is true that most people will continue to read just because they like your personality. If my favorite blogs changed a good portion of their content to things I am not interested in, I would not frequent them anymore. In fact a booktuber I follow has had half fashion and make-up in her last two videos, if she does it again, I don't have the time. I have a personal blog for my non-bookish posts, for non book based movies, recipes, tv, and the like; that is linked on my book blog. Of course you can blog whatever you want, but I think if it is not a personal blog and your posts are too varied, and especially if it is mixed within one post, you will lose followers. I bet there are loads of book bloggers who, aside from books, are also interested in makeup, fashion and TV shows. They're very normal things to be interested in. I also think that if a book blogger (who posted about these things but the majority of their blog was still about books) wrote the occasional post about their other interests, they wouldn't lose followers, they'd gain more. Because the more varied your content is, the more likely people are going to find you. I get that it might be annoying that your favourite booktuber has started doing videos majorly based on other things and not books, but you still enjoy her bookish videos, don't you? Why don't you just skip those videos instead of unsubscribing altogether? I've also considered branching out into other topics on my YouTube channel but I hope that if people weren't interested in those things they would just not watch those particular videos. Good tips! I especially agree with the fourth one. I'm trying to do this, but when it comes to bad reviews, I have trouble, because I don't want to sound like I'm mocking the author...especially when it's an ARC. I guess I have to just find a good balance. This is a wonderful post! I'm definitely going to follow this advice, it's so easy to get caught up in writing about what you think other people want to read and not writing about what you want to write about. Will definitely try to keep this in mind! These tips were ever so useful and I hope that every blogger manages to come across them at some point within their life. I especially tend to struggle with the professionalism aspect, as I feel as if, within all of my posts, I must display a sense of somewhat maturity, which tends to interfere with my true self - as I fear that my topics or slightly more informal language used isn't of a professional standard. The fact that you, such a successful young blogger, are able to confidently prioritise self expression over professionalism goes to show that perhaps I'm regularly seeing my sole purpose of blogging in an overly negative light. Thank you for this post! I hope to see more like it in time. This helped me so much. I've really just started my review and book blog, so I've been nervous. It's a little daunting to try and figure out what to blog about (besides reviews!). I've had a few people tell me negative things about what I talk about, so it's made me unsure about continuing. But thanks for the helpful post!